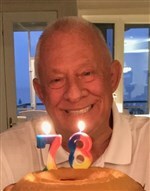 JAMES STEPHENS “STEVE” SMITH, JR.
James Stephens “Steve” Smith, Jr., 78, of Tybee Island, and husband of Margaret W. Smith, died Friday morning, April 5, 2019, at his home. Born in Savannah, Georgia, he was the son of the late James Smith, Sr. and Ollie Merry Smith. His childhood in Savannah was not unlike that of Huckleberry Finn. Steve would often spend time camping out near Fort Jackson with friends. He graduated from Savannah High School in 1958. Steve was a passionate baseball player with whom the Cincinnati Reds expressed interest. Steve was also active in the Boy Scouts of America, attaining the rank of Eagle Scout. In 1961, Steve met his wife, Margaret, while playing putt-putt golf. In 1962, Steve and Margaret were married. Together they started their life together and built their family. Their journey took them from Savannah where Steve started his career working for Stewart Shoe store, Singer Company and W.T. Grant. In 1966, he was transferred with W.T Grant to Jacksonville, Florida. They later moved to Charlotte North Carolina where he worked for Kay Jewelers and the Central Adjustment Bureau before transferring to Nashville, Tennessee for The Central Adjustment Bureau until he moved to Memphis, Tennessee where he started his own business, the Regional Adjustment Bureau Inc., operating it successfully for forty-five years. In that time Steve and Margaret built their dream home, an impressive antebellum styled home modeled after “Oak Alley” in Louisiana which he named the “Savannah” after his place of birth. After retirement, Steve and Margaret moved back to Savannah where they settled on Tybee Island for the last three years of their life together with their beloved cat Maggie. A good-natured and well-loved man, Steve was president of the Bartlett Optimist Club, a member of the Colonial Country Club, and a member of the Covenant United Methodist Church, all of Memphis, Tennessee. He also supported the University of Memphis. After moving back to Georgia, he became a member of the Trinity United Methodist Church in Savannah and a faithful member of the Telfair Squares Luncheon Group where he enjoyed meaningful fellowship and conversation. An avid golfer, Steve also enjoyed bowling, baseball, and watching his sons and grandsons play sports. He also enjoyed oil painting. Surviving family include his wife of 57 years, Margaret W. Smith; daughter Kim Sisk and her husband Kerry, of Bartlett, Tennessee ; sons, Stephen Smith and his wife Kimberly, of Cordova, Tennessee; Michael Smith and his wife Angie, of Germantown, Tennessee;, Kelly Smith, of Memphis, Tennessee and youngest son Benjamin Smith of Cordova, Tennessee. Grandchildren, Amanda Sisk of Bartlett, Tennessee, Savannah Sisk and her fiancé Brett Smith of Bartlett, Tennessee, Will Smith of Cordova, Tennessee, Colby Smith and Stephen Smith of Germantown, Tennessee and Ava Smith Coleman of Bartlett, Tennessee. Great-grandchild Noah Rice of Bartlett, Tennessee. Sister Susan Wood, of Guyton, Georgia; nephew Jeffrey Wood, of Guyton, Georgia; and several cousins, great-nieces and great-nephews. The funeral service will be held in Savannah, Georgia at a later date at Bonaventure Cemetery. In lieu of flowers, the family requests that a donation be made to a charity of your choosing on behalf of Mr. Smith. The family will receive friends on April 27, 2019, from 10 until 11:30 Saturday morning at Covenant United Methodist Church – 8350 Walnut Grove Road, Cordova, Tennessee. Services will be at the church immediately following, conducted by the Reverend Mark Irwin and the Reverend David Weatherly will follow. Margaret, we are so sad to hear about Steve’s passing. It is quiet shocking for us. We met Steve and you 2 times at Trinity but you made us feel welcome. We wonder through Christ’s plans why we meet people in our paths of life and this is one of those times. God absolutely placed us in your path. We are here willing to lift you up in prayer. We are absolutely ready to love you and support you in this time of grief. Our hearts hurt for you and we are here ready to console you in any way we can. Dearest Margaret and family, I am so sad to learn this morning of Steve’s passing. Our family shared so many wonderful memories thru the years. I have always treasured each and every moment we shared! My heart knows so deeply your pain and I am lifting you and the family up in prayer. I offer my sincere condolences and love to you all! Margaret, I was so sorry to hear about Steve. Each time I saw him, he always seemed so happy and had something amusing to say. You both made friends at Trinity and we are here when you need us. I hope to see you soon. Margaret and family, I am so so sorry to learn of the passing of Steve. He and I met years ago at the Weis theater (Trustees Theater) where he was an usher and I worked the concession counter. Our path s crossed again last summer when he greeted me with that warm smile at the foot of steps of Trinity after Morning worship. I was so pleased to see him and he talked of you and family. A few weeks later he introduced me to you. You are in my thoughts and prayers and looking forward to getting to know you. John and I send our sincere condolences to you and your loved ones. Margaret – As your ‘across the way” neighbor of 21 years on Tybee Island, I remember you and Steve as among my first friends on Tybee. I had been here less than a week and ran into you both at the grocery store and I still remember the warmth and welcoming I got from you both. Steve was a big presence here and it quite simply is not the same without his friendly, curious, and sometimes very funny self. My heart goes out to you and your family. I am right here if you need anything at all. Please know that you have been in my prayers for the past recent days. We only met for the first time last Thursday … I was the lady on the beach with our Family. You and Steve were sitting on your pier, enjoying the beautiful, Tybee Island day. Though our conversation was only a brief 45 minutes or so, I was touched by your generous spirit of pure kindness. Steve offered our grandson the sand toy to play with. We were staying at the house behind you for the week. Friday morning we were aware that something was of concern at your home…and since then, you and Steve have been in my prayers. It was only after our return home to Chicago area that I googled to find this sad news of Steve’s passing. I am so very sorry for your loss. I cannot tell you how sad I am about Steve’s passing. He was a good friend and client for 30 years. I will really miss him. My thoughts and prayers are with his family.